The cast and showrunner of Syfy’s 12 Monkeys took New York Comic Con by storm Thursday afternoon as the series previewed its upcoming second season on the Main Stage. 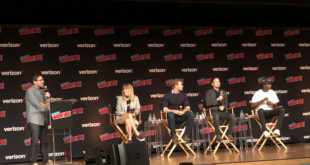 Premiering in April 2016, the cast revealed that the time traveling sci-fi drama will venture into new eras, face bigger threats, and promises to answer some of season one’s biggest questions. The Workprint caught up with Showrunner Terry Matalas to discuss what lies in store for season two of 12 Monkeys during a press roundtable. Where are we going this season? Everywhere. We’re going to the 1940’s, the 1950’s, 60’s, 70’s. We go to places in the future you never thought we’d see. We go to the future’s future. The conspiracy is much larger and we really get to learn about what the Army of the 12 Monkeys really is and what they want. Last year, when you guys were putting the show together you said you had a two-year plan so you could get a lot of the timeline together. Now that you’ve completed the second season, how closely did you adhere to that timeline? Did you find yourself making adjustments? Pretty close. You always make some adjustments because a better idea comes along but the direction is absolutely the same. We knew where we were going at the end of the season. In order to actually tell the season finale of season two we had to go break out what season three was. It’s just something you have to do or else you get caught with your pants down. “We made it up! We don’t know.” We just never wanted to do that. At the panel you said that the plague was just the beginning of something worse. What’s worse than the end of humanity? Well, that’s the question. Clearly The Army of the 12 Monkeys has some post-apocalyptic version of the Red Forest. And what we do know is that the distortion of time makes this foliage really red and really fucked up so what is their larger plan? Why do they keep talking about this red forest? Is the plague only part of their plan? I think one of the trailers says, which they show Jones saying, “The very fabric of existence is unraveling.” That’s a hint toward what they want. What’s the balance or imbalance ratio, you would say, in regards to Jennifer being regressed with her memories or just not wanting to share them at certain times? It’s not really regressed memories. She’s a tortured person who has had a lot of really bad things happen to her. We learn a lot more about Jennifer. Last season we kind of hinted, if you were watching closely, that she kind of knew things that she shouldn’t have known. She kind of know who people were, she would say things like “green to red” which we knew was happening. It seems like she is connected to the way the changes of time in someway and maybe that’s part of what her craziness comes from. Jennifer is a really important character this season. How do you define time this season? You’re going to find out this season. It’s not in the way that we have seen before. We have implied that time is cruel. We’ve implied that it seems to have its own ways. We saw her [Cassandra] scratch disappear on her watch. Time certainly wants certain things to happen. The question is, “Is time on our side?” And, if that’s the case how does mankind and time work together. We are the only species that is aware of time and maybe it is aware of us. Maybe one depends on the other in the same way. We are kind of going into new places with time, which will throw Jones for a loop. This is not Einstein. This is not Hawking. This is not Godel. 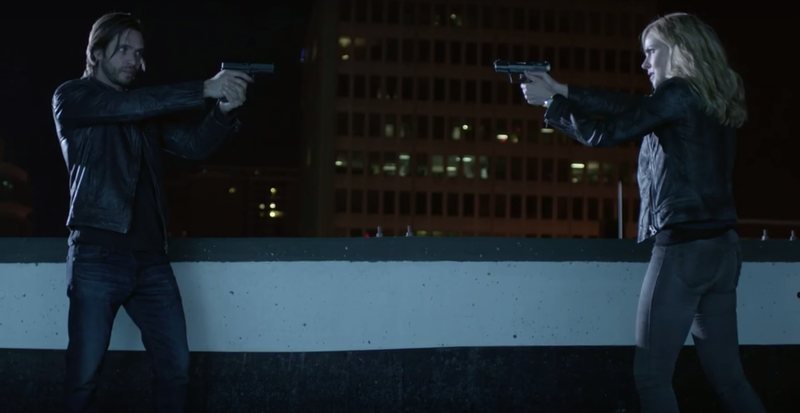 This is something else that she needs to get ahead of and I think it will challenge her character in a really unique way. Season 2 – Dodo Bird. Confirmed or unconfirmed? 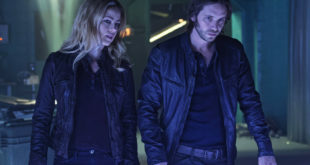 Syfy’s 12 Monkeys returns April 2016. ‘GLOW’ Season 2 Review: Women and the Workforce. Wrestling, too.